The Tisch, is traditionally the groom's reception for men and is usually held at a table that is choc full with food and drink (think scotch!). The groom is surrounded by his father, the bride's father, and close male relatives/friends. The best man and groomsmen are in attendance as well. Although not traditional, many grooms in today's day and age opt to have close female friends and relatives at their tisch. However, many men think of it as a bonding time for the males before the wedding. Normally, the tisch is held where the Minchah prayer service takes place in the afternoon. There is a lot of excitement in anticipation for the events to come. So often the tisch can be filled with back slapping and whiskey drinking encouragement for the groom. Ancient tradition has the groom deliver a speech at the tisch. Not long after he starts, the other men interrupt him promptly with clapping and singing. It's a way of saying, you think you know, but you don't! Although the tisch looks like mostly fun and games, there is a spiritual tradition that is going on as well. 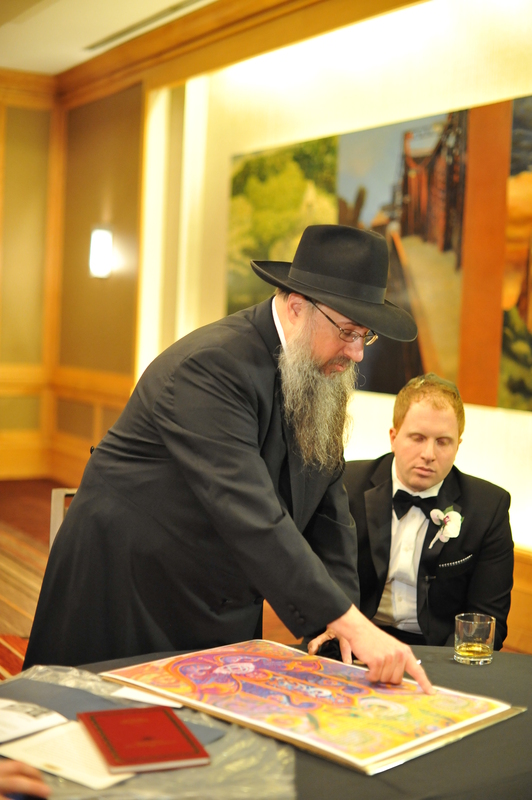 The tisch is centered around the review of the ketubah by the rabbi to make sure that all of the details are correct. Remember that the ketubah is a binding marital contract between the bride and the groom. Personalization of the ketubah is very important and often mistakes can occur that get lost in translation. This is the time when the rabbi will double check that the ketubah is completed and validated. The groom takes a deep breath and realizes that there is not turning back after this moment! After the ketubah is deemed to be satisfactory, the groom will formally accept the commitment of marriage by lifting up a small article of clothing before the rabbi and two witnesses to show his consent. Then the rabbi will add the word v'kanina to the conclusion of the ketubah text while the two witnesses sign the document to make the ketubah valid and binding. And then a big toast to the groom! The groom and his rabbi, father and the bride's father then leave the tisch room and go to the bridal reception area for the veiling ceremony called the bedeken. The tisch is more than just a whiskey drinking party with close family and friends. It is a deeply spiritual affirmation of the groom by the males closest to him in life and it is an expression of the support for his big commitment. 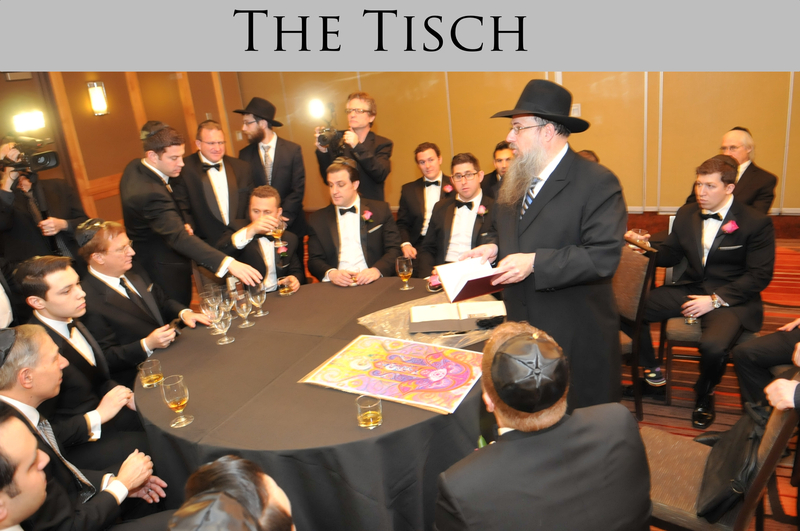 At the heart of it, the tisch is communal celebration of the groom's transition from a single man to a married man.